New Swiss stamps were introduced beginning in 1907, replacing the Numeral and Standing Helvetia definitive postage stamp types that had been in use since 1882. 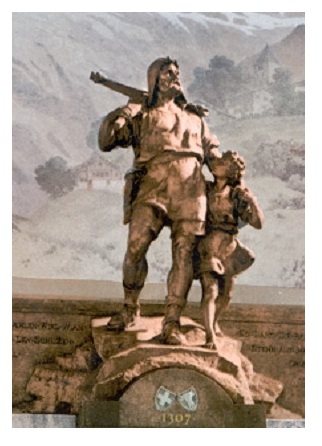 These new lower-denomination definitive postage stamp types featured the likenesses of Switzerland's famous folk hero, William Tell, and his equally famous son, Walter Tell. Though these new lower-denomination stamp designs remained in use for over 25 years, they were disliked by the public, and they were pretty much ignored by philatelists of the time. For the modern stamp collector, most of the sheet-format stamps of this definitive series are still relatively common and inexpensive, almost 110 years after they were first issued. Most collectors prefer to collect all these stamps together in sets, arranged by denomination. That is the way the Scott catalog list them, and that is the way they are all presented on this page. There were many printings of these types over a period of some 26 years, and in the Zumstein and Michel catalogs, they are listed in the years that they were actually issued. For one focusing only on these particular types, these catalog listings can be very difficult to follow. Thus, following each section below, I will include a table containing the year of issue, the Zumstein number, and the Scott number for each of the stamps illustrated in that section. The color descriptions used are those from the Zumstein catalog. This period also includes four higher-denomination definitive Swiss stamps featuring an ornate design with the shield of Switzerland. These stamps first appeared during 1924, with additional printings in 1933 and in 1940. All the new stamp denominations from the 2 C. through the 7.5 C. feature the image of Walter Tell, the son of William Tell. Walter holds his father's crossbow with his right arm and the apple, with a bolt through it, in his left hand. These types are referred to in the catalogs as the "Tellknabe" or "Tell Boy" Issues. 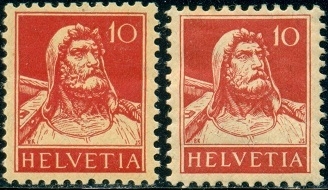 The three Tell Boy definitive Swiss stamps shown above were issued on November 11, 1907 as the lower-denomination postage stamps of the new Sitting Helvetia with Sword definitive series. 02 C. (1907 - Zu. #101, Mi. #95, Sc. #126) - Olive Yellow. 03 C. (1907 - Zu. #102, Mi. #96, Sc. #127) - Pale Brown. 05 C. (1907 - Zu. #103, Mi. #97, Sc. #128) - Green. Modified designs of the Tell Boy type definitive Swiss stamps were issued between 1909 and 1911. The stamps in the image shown above are all Type I. These new designs feature Walter Tell standing on a platform. The frames and inscriptions are also completely different than those of the 1907 issues. Type I - Bow cord in front of stock. Type II - Bow cord behind stock. Letters do not have pronounced serifs. Loop above crossbow is thin and sometimes incomplete, as in Type I. Type III - Bow cord behind stock. Letters have pronounced serifs, especially noticeable at the bottoms. Loop above crossbow is thicker and usually complete. 02 C. (1909 - Type I - Zu. #117, Mi. #111I, Sc. #146) - Olive Yellow. 03 C. (1909 - Type I - Zu. #118, Mi. #112I, Sc. #147) - Blue Violet. 05 C. (1909 - Type I - Zu. #119, Mi. #113I, Sc. #148) - Green. 02 C. (1910 - Type II - Zu. #123II, Mi. #111II, Sc. #149) - Olive Yellow. 03 C. (1910 - Type II - Zu. #124, Mi. #112II, Sc. #150) - Blue Violet. 05 C. (1910 - Type II - Zu. #125II, Mi. #113II, Sc. #152) - Green. 02 C. (1911 - Type III - Zu. #123III, Mi. #111III, Sc. #153) - Olive Yellow. 05 C. (1911 - Type III - Zu. #125III, Mi. #113III, Sc. #157) - Green. The eleven Tell Boy definitive Swiss stamps shown above were issued between 1918 and 1930. These stamps all have crossbow Type II or Type III. Type I - Top of "7" is 1/2 mm thick. The "1" of "1/2" has only traces of serifs. The base plates below the statue are of even thickness. Type II - Top of "7" is 1 mm thick. The "1" of "1/2" has distinct serifs. The upper base plate is thinner than the lower one. Here are the catalog listing details for all the major-type stamps shown in the image directly above. 02.5 C. (1917 - Zu. #136, Mi. #136, Sc. #154) - Claret. 02.5 C. (1927 - Zu. #169, Mi. #198, Sc. #155) - Olive on Buff. 03 C. (1917 - Zu. #137, Mi. #137, Sc. #151) - Brown Orange. 03 C. (1930 - Zu. #182, Mi. #199, Sc. #156) - Blue Violet on Buff. 05 C. (1921 - Zu. #152, Mi. #162, Sc. #158) - Red Orange on Buff. 05 C. (1924 - Zu. #157, Mi. #163, Sc. #159) - Gray Violet on Buff. 05 C. (1927 - Zu. #170, Mi. #200, Sc. #160) - Red Lilac on Buff. 05 C. (1930 - Zu. #183, Mi. #201, Sc. #161) - Olive Green on Buff. 07.5 C. (1918 - Type I - Zu. #138II, Mi. #138II, Sc. #162) - Gray. 07.5 C. (1917 - Type II - Zu. #138III, Mi. #138III, Sc. #162c) - Gray. 07.5 C. (1927 - Type I - Zu. #171, Mi. #202, Sc. #163) - Green on Buff. 03 C. (1933 - Zu. #182z, Mi. #199z, Sc. #156a) - Blue Violet on Buff. 05 C. (1933 - Zu. #183z, Mi. #201z, Sc. #161b) - Olive Green on Buff. Some of the Tell Boy stamp denominations, shown in the sections above, were issued in booklets, and they exist in Tête-bêche pairs, as well. They are all relatively inexpensive. See the specialized catalogs for listing details. Beginning in 1930, many Swiss stamps were treated with a light grilling process, applied with the gumming, to prevent the stamps from curling. 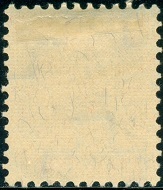 As shown above, it resembles a faint grill of vertical and horizontal ribs covering the entire back of the stamp. This effect can usually be seen, even after the gum has been removed. 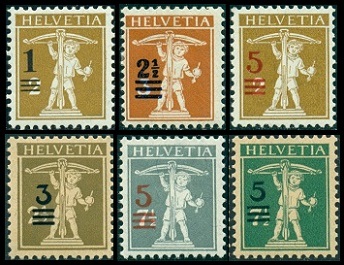 The six Tell Boy re-valued Swiss stamps shown above were issued between 1915 and 1930. These Swiss stamps exist with double and inverted surcharges, and as such, they are very expensive. 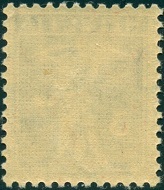 Tête-bêche pairs exist of the 2.5 C. surcharge stamps, and they are common. All the stamp denominations from the 10 C. through the 30 C. feature a chest and head image of William Tell. 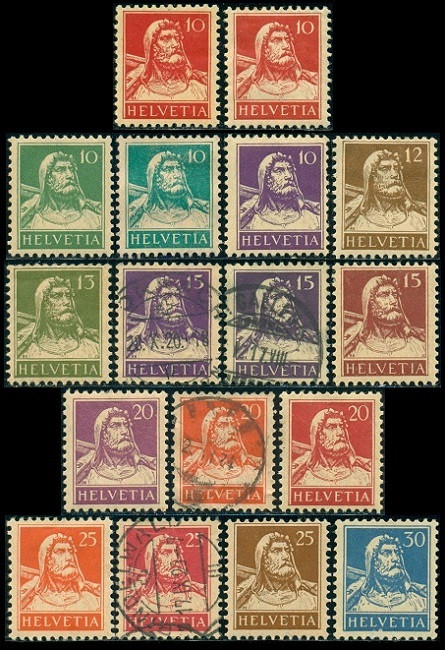 These Swiss stamps are referred to in the catalogs as the "Tellbrustbild" or "Tell Chest Image" Issues. 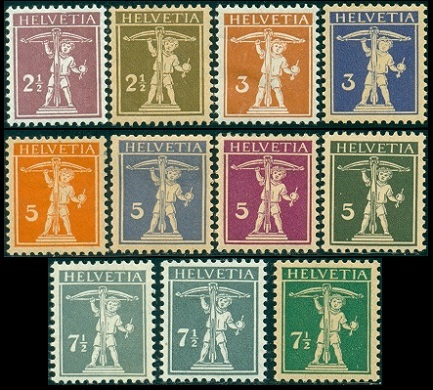 The seventeen William Tell definitive Swiss stamps shown above were issued between 1914 and 1934. The 10 C. (Red) denomination stamp comes in two types, as illustrated above and described below. Type I - Bust is 16 1/2 mm high. "HELVETIA" is 15 1/2 mm wide. The cross bar of the "H" is in the middle of the letter. Type II - Bust is 15 mm high. "HELVETIA" is 15 mm wide. The cross bar of the "H" is above the middle of the letter. Here are the catalog listing details for all the sheet-format William Tell definitive Swiss stamps shown above. 10 C. (1914 - Type I - Zu. #126I, Mi. #118I, Sc. #167a) - Red on Buff. 10 C. (1914 - Type II - Zu. #126II, Mi. #118II, Sc. #167) - Red on Buff. 10 C. (1921 - Zu. #153, Mi. #164, Sc. #168) - Green on Buff. 10 C. (1928 - Zu. #172, Mi. #203, Sc. #168C) - Blue Green on Buff. 10 C. (1930 - Zu. #184, Mi. #204, Sc. #169) - Violet on Buff. 12 C. (1914 - Zu. #127, Mi. #119, Sc. #170) - Brown on Buff. 13 C. (1915 - Zu. #139, Mi. #139, Sc. #171) - Green Olive on Buff. 15 C. (1914 - Zu. #128, Mi. #120b, Sc. #172) - Violet on Buff. 15 C. (1914 - Zu. #128c, Mi. #120c, Sc. #172b) - Dark Violet on Buff. 15 C. (1927 - Zu. #173, Mi. #205, Sc. #173) - Brown Red on Buff. 20 C. (1921 - Zu. #154, Mi. #165, Sc. #174) - Red Lilac on Buff. 20 C. (1924 - Zu. #158, Mi. #166, Sc. #175) - Orange Red on Buff. 20 C. (1925 - Zu. #174, Mi. #206, Sc. #176) - Carmine on Buff. 25 C. (1921 - Zu. #155, Mi. #167, Sc. #177) - Orange Red on Buff. 25 C. (1922 - Zu. #159, Mi. #168, Sc. #178) - Carmine on Buff. 25 C. (1925 - Zu. #175, Mi. #207, Sc. #179) - Brown on Buff. 30 C. (1924 - Zu. #160, Mi. #169, Sc. #180) - Blue on Buff. 10 C. (1933 - Zu. #184z, Mi. #204z, Sc. #169c) - Violet on Buff. 15 C. (1933 - Zu. #173z, Mi. #205z, Sc. #173a) - Brown Red on Buff. 20 C. (1933 - Zu. #174z, Mi. #206z, Sc. #176c) - Carmine on Buff. 25 C. (1924 - Zu. #175z, Mi. #207z, Sc. #179a) - Brown on Buff. 30 C. (1933 - Zu. #160z, Mi. #169z, Sc. #180a) - Blue on Buff. The 10 C. (Red) denomination (regular gum) was also issued in booklets. Eight of the denominations (regular gum) also exist in Tête-bêche pairs, and with only one exception, they are all inexpensive. See the specialized catalogs for listing details. The four William Tell re-valued Swiss stamps shown above were issued between 1915 and 1921. 20 C. on 15 C. (1921 - Zu. #150A, Mi. #160A, Sc. #197) - Black surcharge. 05 C. on 02 C. (1921 - Zu. #150B, Mi. #160B, Sc. #198) - Blue Surcharge. The four Shield Type higher-denomination Swiss stamps shown above were issued on October 1, 1924. The ornate designs feature a Swiss shield. These denominations were re-issued in 1933 on paper with grilled gum, and the 90 C., 1.20 Fr., and 1.50 Fr. denominations were re-issued in 1940 on chalky paper, with smooth gum. Used examples of most of the varieties of these higher-denomination Swiss stamps are common and inexpensive, however, mint condition examples can be pretty expensive. 90 C. (1924 - Zu. #163, Mi. #194, Sc. #200) - Green and Red on Green. 1.20 F. (1924 - Zu. #164, Mi. #195, Sc. #201) - Lilac Red and Red on Rose. 1.50 F. (1924 - Zu. #165, Mi. #196, Sc. #202) - Ultramarine and Red on Blue. 2.00 F. (1924 - Zu. #166, Mi. #197, Sc. #203) - Blackish Gray and Red on Gray. 90 C. (1933 - Zu. #163z, Mi. #194z, Sc. #200a) - Green and Red on Green. 1.20 F. (1934 - Zu. #164z, Mi. #195z, Sc. #201a) - Lilac Red and Red on Rose. 1.50 F. (1934 - Zu. #165z, Mi. #196z, Sc. #202a) - Ultramarine and Red on Blue. 2.00 F. (1933 - Zu. #166z, Mi. #197z, Sc. #203a) - Blackish Gray and Red on Gray. 90 C. (1940 - Zu. #163y, Mi. #194y, Sc. #200b) - Green and Red on Green. 1.20 F. (1940 - Zu. #164y, Mi. #195y, Sc. #201b) - Lilac Red and Red on Rose. 1.50 F. (1940 - Zu. #165y, Mi. #196y, Sc. #202b) - Ultramarine and Red on Blue.